World events wont let North Americans ignore Muslims anymore. Whether those Muslims are villagers in Iraq or neighbors down the street, Breaking the Islam Code offers everyday Christians profound insight into the way Muslims think and feel .J.D. Greears ability to communicate challenging heart truth, plus his expertise in Christian and Islamic theology and two years experience in a Muslim-dominated area, make him the perfect author for this empowering, insightful, reader-friendly book. It transcends traditional apologetics, focusing on helping Christians understand what is deep in Muslims hearts, behind their theologywhich will lead to friendship and effective communication of the gospel respectfully turn many of the primary objections into opportunities to share the faith avoid unnecessarily offending Muslims theyre interacting withReaders will be excited that sharing Christ with Muslims is something they can doas everyday Christians in their own cities, campuses, and workplaces. About "Breaking the Islam Code"
J.D. Greear, PhD, is an author and the lead pastor at the Summit Church in North Carolina, one of the top 20 fastest growing churches in America. His books include Breaking the Islam Code (Harvest House) and GOSPEL: Recovering the Power that Made Christianity Revolutionary (B&H). Customer Reviews For "Breaking the Islam Code"
This is one of the best resources I have come across for learning how to share the gospel with our Muslim friends. One problem I have found with similar books on Christianity and Islam is that they are far too academic in their approach, pointing out the logical fallacies of Islam. While this information can be useful sometimes, Greear reminds us in this book that "we are not trying to win arguments, but we are trying to win the person". 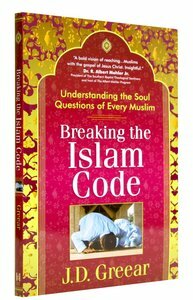 'Breaking the Islam Code' is easy to read and offers highly practical advice for having conversations with Muslims. It explains how to present the gospel of Jesus in terms that Muslims are more likely to comprehend. Ultimately it is not our words or clever arguments, but the power of the gospel and the word of God that will transform the lives of our Muslim friends. The author has a deep understanding of how Muslims think and the reasons why they object to the claims of Jesus. Greear offers great tips on how to get them reading the Bible with you and how to tackle issues such as the Trinity, the "blasphemy" of the cross and the deity of Jesus. 'Breaking the Islam Code' is an excellent resource, and encourages us to be like Paul, who was "not ashamed of the gospel, for it is the power of God for salvation to everyone who believes" (Romans 1:16).